Click the button below to add the Generac 7042 22kW Guardian Generator with Wi-Fi to your wish list. NEW 2018 WI-FI MODEL (SAME AS MODEL 70422). The Generac 7042 is run by the Generac G-Force Engine. This engine is strong and stable, capable of handling strenuous use, is pressure-lubricated, and requires less regular maintenance than most engines. Maximum 22000 LP Watts and 19500 NG Watts. It operates at a reasonable 67 Decibels, offering a quiet power solution. The True Power TM Technology in this model means reducing harmonic distortion to less than 5%. This equals cleaner quality of power for sensitive devices and appliances. The 7042 is Wi-Fi capable. 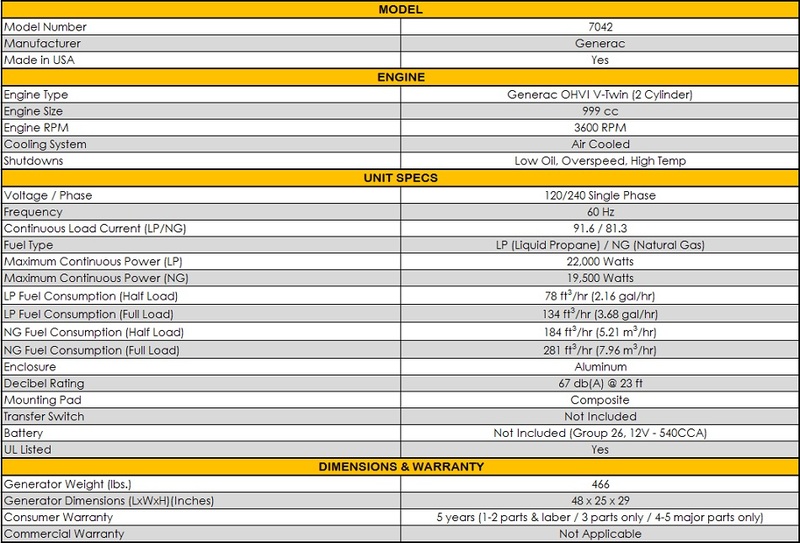 The Generac 7042 comes with a 5-Year Limited Warranty. * This model does not include a Transfer Switch. The Generac 7042 22/19.5kW Air-Cooled Standby Generator is yet another option from Generac’s Guardian® Series home standby models. This generator series contains the largest generators of any brand available. The 7042 supplies MSRP at the lowest cost per kilowatt of any residential backup generator. In total, it is an excellent complete backup electricity system for your house. The Generac 7042 is powered with the help of a Generac G-Force Engine. This engine is one of Generac’s best. It is reliable in the long-term and able to handle constant use. It’s pressure-lubricated and, because it is so stable, it needs less upkeep than other engines. In terms of power, this generator and its engine can supply up to 22000 LP watts and 19500 NG watts. It does not come with an Automatic Transfer Switch. The 7042 is quiet; it runs at a very reasonable 67 Decibels, making it perfect for homes in quiet neighborhoods. Additionally, The True Power TM Technology of this generator lessens harmonic distortion to less than 5%, which means cleaner power quality safe for all sorts of appliances. A Quiet-TestTM Self-Test Mode also slows the generator’s RPM so that it may self-test. These five or twelve minute tests help make sure your generator is running properly and make it more fuel efficient. The Generac 7042 features technology like the Generac Evolution™ Controller. An LCD display shows you battery levels and maintenance schedules, and offers information in multiple languages. Plus, the Mobile LinkTM Remote Monitor links you to your generator from any distance. This link—sold separately—lets you keep an eye on your unit’s status so you know it is performing while you are away. You can see most of the details of its progress and any service needs that may need to be addressed. All it takes is an internet connection and computer or smart device to make sure that your unit is running efficiently while you are gone. In addition to having modern technology, this model is sturdy. It has an Aluminum Enclosure and RhinoCoat powder-coated finish to keep it safe from the elements, and wear and tear such as corrosion. During a storm, it can resist 150 mph winds. The Generac 7042 22/19.5kW Air-Cooled Standby Generator has a 5-Year Limited Warranty for service needs. Generac also offers their 365-days-per-year, 24/7 customer support for your needs. All of Generac’s generators and engines are constructed in the U.S.
Good value and a quality product. It has been installed for 6 months with no issues and 1 power outage. Preformed as it should. We are pleased with our purchase of Generac's 7042 20kW from AP Electric & Generators. They were helpful in helping us decide what generator to purchase with no pressure. Arrvived quickly and undamaged. Would order from this site again. Local electrician said installation was a snap. Charged us about $2,000 to install and works perfectly in the one brief 2 hour power outage we experienced since it was installed. I ahve had this Generac 7042 generator installed for about 6 months now. works perfectly and I have not had an issue yet. AP Electric was great to work with. shipped fast. Great generator and great customer support from this website. No regrets my Generac 22kW generator works great. Love my Generac. Works just as advertised. Quick shipping from AP Electric and no issues on the install. Recommend buying the concrete pad saves a lot of hassle. Great generator and fast shipping from AP electric. I would purchase again. Everything was perfect,beginning from the day of the order. Received a lot of help on the phone prior to my purchase. Never pushy and they were extremely patient. I took advantage of the 2% wire discount the were offering. Very pleased with everything. Prompt service and delivery to our shop and one satisfied customer. I live in North Carolina. I ordered my Generac 7042 22kW Guardian Generator from AP Electric & Generators on Friday Afternoon on 9/23/16 (Friday). It was delivered in the afternoon 9/26/16 (Monday). Electrician finished installation on 9/28/16. Then here comes Hurricane Mathew. Generator kicks on October 7. It is now October 11 and the generator has been running constantly since the 7. Absolutely no issues. I really don't care when power is restored as I have as if there was no power outage. Very big thumbs up. Great job AP Electric & Generator. I needed this Generac 7042 22kW Guardian Generator in hurry for a customer installation before Hurrican Mathew. It shipped the same day I ordered and you provided tracking so I knew when it would arrive. One happy customer. Quick deliver on my Generac 7042 22kW generator. I ordered it Monday and it arrived on Wednesday. Outstanding I can't comment on the gnerator yet as it is not installed.